1. H5P will support reusing content some time in the future, but it will probably take a while for us to get there >JPE, the purpose here is to allow to combine exiting Contents into one Content, e.g. we can create 100 Contents, and every time select 10 of them and put it into 1st "set" and use them as an assignment, another month, we may select another 10 of Contents, and put it into 2nd set for assignment. 11. Where is it fixed layout? In the editor? >JPE, in player, the slideshow, just zoom in scale, in small screen, it is difficult to read the word. it is not really a problem, but it is what is a best way to make a slide to fit into big screen and small screen. I am not sure what is correct way to do. 12. What Wordpress plugin are you using to display file lists? >JPE, it's H5P plugin, in Post editing screen, beside "Add Media" button, H5P plugin added another button called "Add H5P", after click the "H5P", you will see list of H5P Content to insert a shortcode into a post, the shortcode looks like [h5p id="8"], if the shortcode could be displayed as one of column in the list on page "All H5P Content", it would be better. Firstly H5P is a great initiative and I am really enjoying working with this library so far. I support the idea of tagging/categorising content with the view to display content based on tags. I am creating a video library and for this it would be ideal to have this functionality and control how the videos may appear on the page/post and to search the videos/content. At the moment, the only way I can do this is to place the content in a post and metatag this. Since 'interactive video' is a content type and not structural element, do you see H5P moving this way? Also would be keen for the interactive video content type to be fully functional on iphone 6. At the moment, I see the video but the overlayed interactivity is lost. Hi! I'm not 100 % sure if I know what you mean. H5P will be supporting tagging in WP, we have funding for that.I think H5P will support including content inside other content based on tags in the future, so that you for instance may create a Question Set that includes 10 random questions about McGyver for instance, but this will take more time. Did I answer your question? Thanks for the message. What I meant was more the former "H5P will be supporting tagging in WP". - have the ability to click on a H5P content entity and display in its own dedicated page/post and assign a template to it. In a sense, h5p content types are very much already their own custom post except it is missing the ability to natively add taxonomy and manipulate the way it is displayed. To achieve the above, I am inserting each individual h5p content type into a video post, tagging and categorising the post , adding a feature image, then displaying as the wordpress theme displays the posts (by category, can be searched, can be listed in the side navigation). Instead of creating the post as a container to apply all the taxonomy to, it would be great if H5P worked natively like this. I can see that this is a big request/question but I see it being very useful and optimising the content created. Thanks a lot for sharing. I didn't know that such short codes are common in WordPress. Will look into it. The first step will be tag support, but not in the short codes to begin with. Joubel is implementing the tag support, sponsored by a University in England, but there are no sponsors for the rest you mention here yet. 11. Yeah, it's quite hard to make such a content type work well on small screens since the relative positioning and sizing of each element on the screen may be important. A mobile friendly view would perhaps consist of displaying each of the elements below each other. Editors are not supposed to use texts like "In the picture to the right you see a Koala" but they tend to do it in content types like the presentation content type. We'll consider doing something about this problem though. 12. Ok, I've asked the wordpress guys to consider it. I'd like to make a suggestion. I have successfully set up H5P on my wordpress blog to host mobile training courses. I would be very helpful for people who have smaller smartphone screens to have the <-> full screen button to be a big button (preferably positioned like other H5P functions) directly inside the content. Does that make sense ? Would that be possible ? The fullscreen button is different in different content types. What content type are you working with? I am trying to create many similar practices in a presentation. There are many images are shared cross slides (or even questions). Is it possible to share these media resources? What is the brief idea to do content reuse? H5p would have a kind of question pool? I think jp_eagle talked about the similar thing. Just would like to clarify a little detail thing. On the other hand, is there anyway that I can import or generate similar questions by some kind of data strcture (such as xml or *.csv)? Do you have plan to enhance massive production for a online trainer? I am thinking to have a programming way to produce similar questions. Is it still a long way to go? Maybe we could have a small current solusion that having a little program to produce specific h5p code/content. Your valuable commets would be really appreciated. We're aware of the potential here. 1. We've tried to simplify the json format for the content so that professionals may produce H5P content by hand by editing the json in their favourite json editor allowing very efficient production of content that may be packaged and uploaded as H5P files. The uploading part should be made simpler but if I where to create something massive with a great potential for reuse I would consider doint it in a text editor or atleast parts of the work in a text editor. 2. There are textual edit modes for summaries and questionsets making it even faster to create questions by just editing text. 4. Reuse of H5P components via a component browser or similar. It will take some time until these improvements are ready and it depends on the priorities of our sponsors. It seems OK for me now. Thank you very much for the quickly response always!!! It seems OK for me now to build a small application for a trail. I should have some practical feedbacks after doing it. Hi, I work for a UK-based non-profit organisation OneWorld UK that provides technology solutions for health and governance projects in UK, Africa and Asia. We are looking for an eLearning app "editing tool" which will allow non-programmers to create eLearning apps. We imagine a WYSIWYG editor where you can define the pages in an app, and the eLearning widgets on those pages. Initially, we could use this to prototype app designs and then implement them in the normal way using a mobile app IDE such as Android Studio. Ultimately though it would be nice if we could actually create native or Cordova based apps directly from the "app editor". I've installed H5P with Wordpress and think it could be what we are looking for. I am using the standard Wordpress page editor to embed H5P packages in pages (which represent pages on the app), but it would be nice if there was a more WYSIWYG way of doing this ... ideally by dragging-and-dropping H5P packages onto the page. Have you got any plans, or ideas how to achieve this? Would Drupal or Joomla provide a better interface? Can you share what your next release might contain? I'm glad to hear that you're considering using H5P. It seems to be a really meaningful project you're working with. We're constantly improving all parts of H5P including creating a "pages" content type where you'll be able to put together existing content types in columns on pages. On mobile phones there will be only one column while on big screen pcs there might be many. The editor for this content type won't be very wysiwyg to begin with, but we'll make it more and more wysiwyg as we move forward. Feel free to contact us if you think we should try to combine some of our efforts. We also have some projects targeted at African countries. This is an amazing resource for teachers - thank you for your time and effort! Has anyone had any experience integrating with Pearson Learning Studio (aka eCollege LMS). I would love to be able to use H5P in that. I'm not aware of anyone, but it might be. From this page I see Pearson Learning Studio is compliant with LTI v1.0 and v1.1. As you see in our roadmap, LTI for H5P is planned . I don't know yet when that will be. Are there any plans for exporting projects as a single zip so anyone can use them without PHP? Yes, we're planning to add this, but we don't have any eta for this feature yet. So in conclusion, I find that there are alternatives out there so I would begin structuring some type of funding plan and in the event you don't, thankfully I have other options, but I do like what you're doing here and will certainly come back to using h5p for certain educational tasks (which I just found out about yesterday) should you guys be taking that very seriously because I'd hate to see h5p go to waste. 1. Do you have an expected release date for these UX upgrades? 2. Is there a overall changelog I can follow for h5p as a whole? 4. When do you plan on releasing a paid version? This is a great project but it is very buggy as shown above. With products like this, there is ALWAYS a direct correlation between funding for the project and project quality. I'd hate to see h5p end up in the trash bin because you're not being properly funded. I would gladly pay for this product should it be properly supported and constantly updated with bug fixes and features. What options do you offer ? Do you offer LTI Support ? Is your LMS written in PHP? Is your LMS written in PHP? With todays code you may create a platform integration of H5P - an H5P plugin for your LMS, or you may embed content via iframe - the content is xAPI enabled. We've been recommended to add LTI support for H5P.org before doing a Moodle plugin since Moodle sites often isn't updated frequently and H5P is moving forward quite quickly. A Moodle site that hasn't been updated the last 3 months probably wouldn't be able to use the latest H5P libraries. 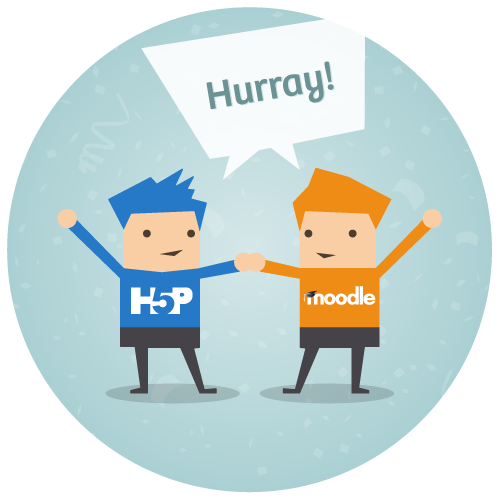 The idea is that Moodle users could then use H5P.org to create their content and embed it in Moodle using the "External Tool". Grades would then be recorded in the users grade book. So the main advantage would be that Moodle users would always have access to the latest stable versions of the H5P content types without having to worry about updates. The biggest draw backs would be having to log in to two different sites, and less customization options. To begin with it wouldn't be possible to change the styling for instance. Evrytime when an admin does login in Moodle, he/she gets a warning to update the plugins which are registrated in the Moodle plugin directory. So... if the libraries are added as a subdir in the plugin then it should work. Thank you for sharing. I think the problem on some sites is that they have decided not to update Moodle in the middle of the school year because of the risk of introducing bugs or other problems. Have you started to use the plugin on github, or are you using another plugin. The github plugin isn't done yet, but I'll make sure the problem you mention gets sorted out before the release. Thank you for reporting! I noticed that the user result would be reset when the node updated (no matter content or just settings) in drupal. Is it possible to change to reset the user data only when the h5p content changed only? Was this added in the future improvement already? By the way, I tested Jan. 2016 release. The copy and past function helps very much for the author and in my opinion, this is a BIG improvement. Thank you for your great effort. We could try that. I think we considered this, but I can't find a log of such considerations. It might be very easy or it might not. The json coming in is purified by PHP, the json being saved is generated by the editor. I don't know if they will be exactly the same or what kind of differences might be there if they are not. Whitespace changes for instance might not be super easy to handle since the author might have done a white space change manually. Could we have a half-way solution? Thank you very much for yoru quick comment, falcon. If the algorithm is very complicated, maybe it would be helpful (to the author) just to have an option: NOT to reset the result data when updating the node (also if the option is checked, the modified h5p should not be updated to avoid unpredictable situations). What do you think? That is definitively possible! I don't think the core team will be able to fix this very quickly since their road map is quite long, but hopefully someone else in the community will be able to do something here or fund it. It is under development. It should work for uploads, but the authoring tool haven't been integrated yet. You could create H5Ps on H5P.org for instance and upload them to Moodle using that code, but I wouldn't use it in production yet. Hi, May I know the main picture of the roadmap item 19. Android, IOS and Windows apps for playing H5P files offline with xAPI support and more? I need to show h5p content in the mobile app and better if xAPI support of course. According to my brief search, in the kivy/ionic framework, it is possible to communicate with drupal from the mobile app, but does h5p need to provide service in drupal? Is there any plan or milestone about this? Thanks. We don't have an ETA for this yet, and the first thing we will do is plan how we would implement this. Use cross platform technologies like PhoneGap or create native apps for instance? Make a complete app or just an H5P player/authoring tool that others may extend and create various experiences with? Won't start working on this this year unless someone orders it. I'm sorry I can't be more helpful here. We don't have any detailed plans for this yet. Any chance of an LTI integration with Canvas by instructure LMS. I think we'll be adding that in the near future, yes. Many organizations seems to be interested in making it happen. Hi, I would be glad if you could add Dot-a-dot game to your content list! Thanks anyway for a great site! Thank you for the feedback. Do you have a link to a good example of this game? I see, cool examples. Are you looking for the more classical variant with an image as the background, or is a video background important to you? We don't really need a video, not that we can think of now. However we discussed that adding an audiofile that would play the instructions could be good.